The Gentleman Crafter: National Craft Month with Graphic 45! National Craft Month is HERE and Graphic 45 is celebrating with some inspirational projects from a bunch of the Design Team in all areas of paper crafting! I would be so honored if you would join me over on Graphic 45's Blog today and check out the amazing projects from so many cool designers. 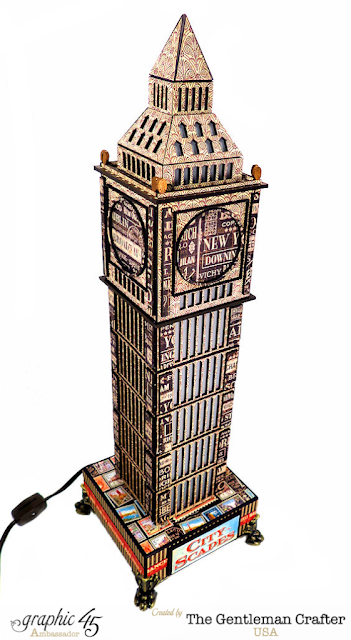 I share the Big Ben Lamp in one of my favorite collection....CityScapes. For more pictures and inspiration, please hop on over to Graphic 45 and check out the amazing projects! This Big Ben light is just too cool I want to make this so badly. Are you offering it as a kit? Please!!!!! I agree. This is Fabulous. I would love to have a kit!